It’s hard to make good decisions with minimal information. Having access to data, and the tools to quickly analyze that data, is essential for any distributor. Without data, you are blind to how your business is performing and areas for improvement—all you have to go on is instinct. A robust business intelligence (BI) system can provide new insights to help steer your distribution organization clear of obstacles that impede growth—and toward the opportunities that enable it. A monthly report just doesn’t cut it anymore. You need real-time information, and if you’re running legacy software, it’s probably slowing you down. Which of your company’s top 10 products haven’t sold in 90 days? How many customers do you have with sales of more than $10,000 in the last fiscal period but whose sales are declining month-to-month? How many customers do you have whose sales are up but whose profits are down? How many active customers are not buying your top three products? What is the total value of slow-moving stock in each of your branch locations? If you can’t answer these questions within five minutes, it’s time to seek a better solution. Epicor can help. Epicor Software Corporation offers a cutting-edge BI tool that can help your distribution business reduce costs, develop (and deliver on) targeted strategies, and improve overall decision-making. 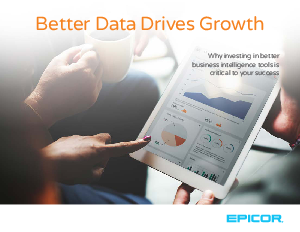 When you integrate the business intelligence features of Epicor Data Analytics with Epicor Prophet 21 business management software, your distribution enterprise has real-time access to data you need to compete and grow.